From Canada in the north down to Argentina in the south, two facets of one regional market are apparent. On the one hand, the North American wind market is preparing for continued, albeit steady growth, while Latin America’s is gearing up to take off. Today Latin America’s annual installed wind capacity is a fraction of that of North America. But this will change so that by the end of the decade annual installed wind capacity across Latin America, including the Caribbean, will be just under half of that of North America. 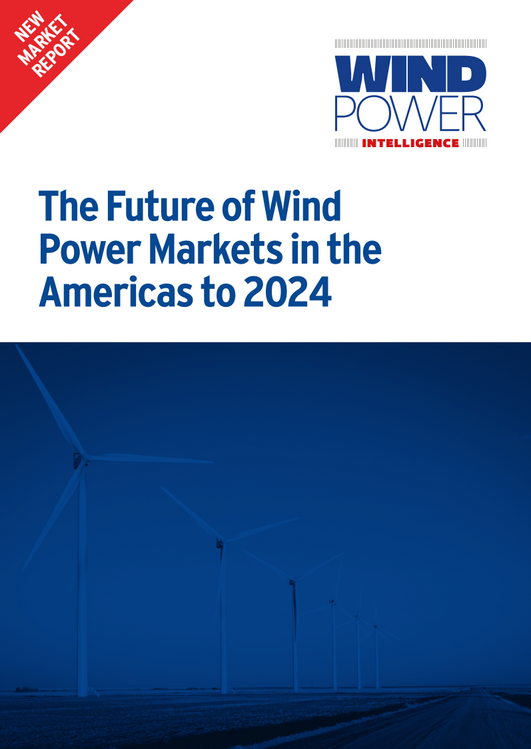 This new report from Windpower Intelligence offers a detailed breakdown of the markets in the Americas and forecast future growth based on a thorough analysis of the key trends and drivers shaping the region to 2024. This report presents an overview of American wind markets, policy, drivers and challenges and a forward look at the markets for the period 2015–24. 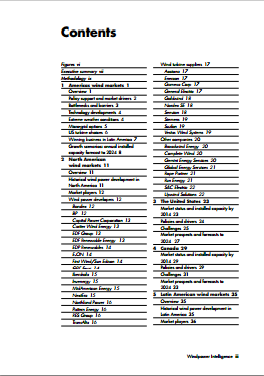 The report covers the American continent, including North America, Latin America and the Caribbean countries. This report is based on the Windpower Intelligence (WPI) database, as well as independent research conducted specifically for this report. For the purposes of formulating capacity forecasts for this report, we only took account of projects that are currently ‘in progress’, meaning that they are not yet in operation, nor have they been put on hold or cancelled. The WPI tracker was used to produce a bottom-up forecast of future American market trends. For the data analysis, we used a snapshot of the database taken on 11 December 2014. Information we may have learned after that date is not reflected in this report. Our short- and medium-term forecasts of future installed wind capacity are drawn from the December 2014 issue of the WPI Global Forecast. This is a monthly forecast report that provides up-to-date country forecasts based on on-the-ground research alongside collection and verification of pipeline data. Our long-term forecast of future installed wind capacity is produced based on analysis of future pipelines in our WPI database, linear regression analysis on historical installed capacity and research on individual countries’ policies and targets. 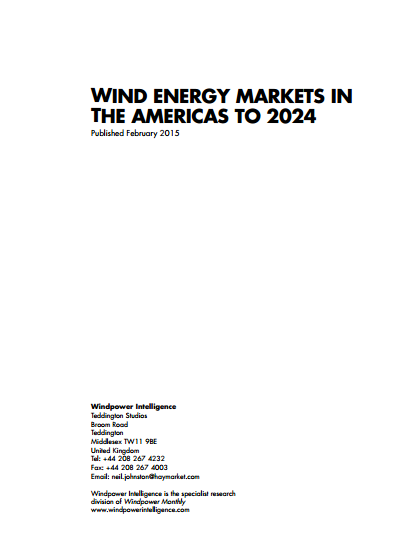 The Appendix to this report provides an overview of the US wind energy repowering markets. Based on existing information on wind farms that have been repowered and inside knowledge on plans for further repowering, it sets out three repowering scenarios and outlines low, medium or high growth for each of them. 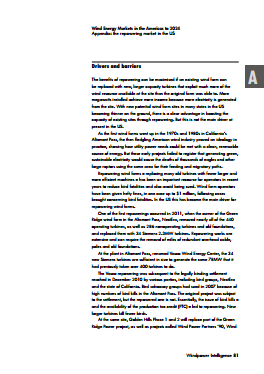 In the low-repowering scenario, this report assumes that only 30% of aging wind farms (more than 20 years old) are repowered. The medium-repowering scenario assumes that 50% of aging wind farms are repowered. 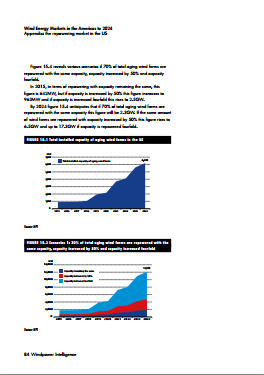 And the highrepowering scenario assumes that 70% of aging wind farms are repowered. For each repowering scenario, we have envisaged three growth rates. If the repowered capacity remains the same as the capacity it replaces, we will see slow growth. Medium growth will happen if capacity increases by 50%, and high growth if capacity grows fourfold. All of these scenarios and growth rates are borne out by actual developments at aging wind farms in the US where repowering has taken place. While there is a vast amount of variability, we hope that these scenarios and growth rates provide a useful indication of the potential US repowering market in the near and longer term.